If you’re anything like us, you don’t like being compressed and this sleeping bag by Naturehike has the perfect solution for that. 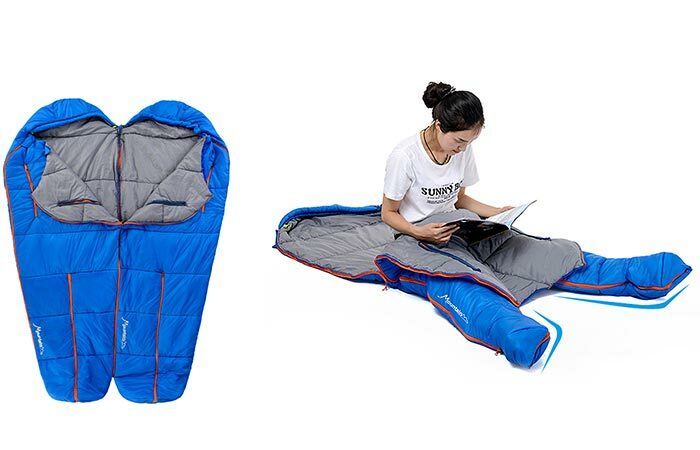 This sleeping bag measures in at 31.49″ x 82.67″ and only weighs in at 2.75lbs. The 320D Nylon shell and 240T poly pongee lining also makes this sleeping bag windproof and water resistant. Starting off with the construction, this sleeping bag features a 320D nylon shell and a 240T polypongee lining that delivers excellent heat retention. This sleeping bag has been filled with cotton to ensure that you have both optimal warmth and comfort. If you were worried about rain or dew, there’s no need since the Naturehike’s construction is both windproof and water resistant. This sleeping bag is also unique in the fact that it can be spliced together to make a double bag. It can also be unzipped to give you complete movement freedom. What sets this sleeping bag apart from the rest, lays in the fact that it is modular. We mean modular in the sense that it has multiple zippered areas that allows you to zip it up as a cocoon sleeping bag, or you could split the legs so that you can comfortably sit and walk around with your legs freely. This sleeping bag also features zippered openings for your arms. 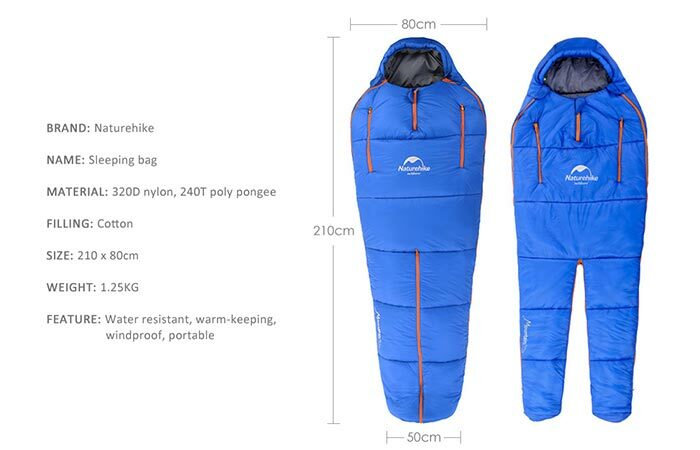 Another interesting aspect is that you can splice two of these sleeping bags together to create a double sleeping bag for you and your partner. 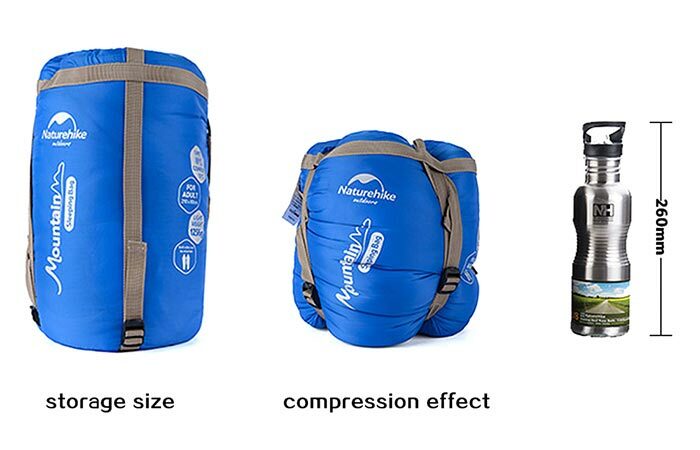 When compressed, this sleeping bag only measure 10.2″ which makes it exceptionally easy to store and transport. This sleeping bag doesn’t shy away from the cold either with a comfort level of 10⁰C (50⁰F) with a limit of 5⁰C (41⁰F). It’s also ultra-lightweight at only 1.25kg (2.75lbs), measures in at 80cm (31.49”) x 210cm (82.67”) and packs up to only 26cm (10.2”). You can purchase it in either Blue or Sweet Orange colors.